One of a kind - sampling of recent owner-directed top-to-bottom, unique remodel, including lighting and Homestead-style, reclaimed-wood furniture Bluefin Bay Premium Home 56A is a one-of-a-kind redecorated unit at the Bluefin Bay Resort on Lake Superior`s North Shore. Enjoy the sights and sounds of Lake Superior to make any happy hour even happier Just steps away from an exclusive ledge rock Lake Superior shoreline. Our kitchen is large, convenient, and fully equipped, comfortably integrated with the great room - and all appliances were recently updated as well At Bluefin, exclusive here - like many fine hotels, this Premium Home offers Keurig state-of-the-art-coffee, single-cup brewing with famous flavors Fireplaces galore - 2 fireplaces to be enjoyed while surrounded by owner-unique furnishing and decor Views of Lake Superior abound from the living room. Unique reclaimed wood dining room table provides seating for everyone to enjoy a home cooked meal. Unique at Bluefin - owner-directed top-to-bottom remodel makes most of north-country lighting, furniture and, you might say, pet-friendly artwork Seldom seen at Bluefin - special fan, part of owner-choice remodel which also upgraded privacy shade on door, master bedroom Coming into use at Bluefin - owner-directed remodeling included maximized-sanitation new Trajet whirlpool AirTub, 2-person size -in the bathroom These exclusive Bluefin Bay by Owner units are only available through Cascade Vacation Rentals. Escape the hustle and bustle of city life in a truly unique retreat on the North Shore. Lake Superior calls from the exclusive Bluefin Bay Premium Home 56A Enjoy the sights and sounds of Lake Superior to make any happy hour even happier Views of Lake Superior can be enjoyed from the living area. The ledgerock shoreline is ideal for a stroll along Lake Superior or for sitting back and watching the waves roll in. Like other Resort guests, enjoy the year-around outdoor pool. For this home, just steps away - with Lake views, adjacent whirlpool and sunning decks Like other Resort guests, enjoy the year-round outdoor whirlpool - just steps away, with Lake views, breeze-control panels, adjacent sunning decks Like all Resort guests, enjoy fitness center, sauna, pool, whirlpool. 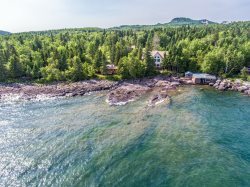 For this home, all just steps away - just use your Splash-n-Soak keycard The Historic Tofte Pier gives visitors a glipse of the history of this beautiful area. Learn more about the Tofte Pier and the area where Bluefin Bay now stands. Grab a bite to eat at the Bluefin Grille. Pick up a gift for loved one back home in the resort`s gift shop. Look for signs of North Woods Whimsy. Take the kids and/or grandkids for a walk to the Bluefin Bay Play Area or the nearby Tofte Town Park and gaze upon Lake Superior while they frolic, maybe watch a boat being launched Community fire pit and open field area lets you mingle with fellow guests. In the summer the field is a soccer field and is an ice skating rink in the winter months. HIGHLIGHTS: Now you can enjoy top-drawer *Premium Home* comforts AND Bluefin Bay Resort ambience – in the same vacation stay. Overview - ground-level 56A has kitchen, living/dining great room, fireplace, queen bedroom, 2-person modern AirTub whirlpool, sofabed, step on/off deck. (See upper-level 56B for king and queen bedrooms, wet bar (microwave and fridge), 2-person whirlpool, fireplace.) Specially priced direct-from-owner, thanks to independent owner control (no resort fee). Resort's indoor/outdoor pools & hot-tubs included. Uniquely decorated & furnished with owners' personal touch. Just steps from the rocky shoreline. Guest Appreciation Coupons included (first-time guests get $25 or $35 for 3 nights, increasing nightly to $185 or $270 6 nights; return guests get $65 or $95 for 3 nights, increasing nightly to $350 or $270 6 nights; possibly less if booked under specials); each additional night brings exponentially increased $$. See ** for Coupon example. Coupons good for bikes, canoes, kayaks, golf, off-site spa services & charter fishing; fine dining; shopping; & in season skis, boards, snowshoes and more. REST OF STORY: Home 56A is the ground-level section of home 56 (one of only 3 *Premium Homes* at Resort). 56A is similar, but higher value, to a style Bluefin Bay Resort’s system labels “Grand Superior One Bedroom Condo.” But it definitely has a guest-friendly "look & feel" of its own. Sumptuous master bdrm; sofabed, too, if needed (but never add’l person charges in 56A). Custom rugged reclaimed-woods & Hickory furniture, northwoodsy styling. Waters of the mighty Lake just steps away. Lounge on large deck & relish sounds of waves. 2 ceiling fans. 2 HD TVs. Amenities galore: Famous Keurig single-cup-perfect coffee. Famous K-cup flavors, all you want. World-class sachet teas & hot cocoas. Massive mirrors. Bountiful bedding. Luxurious linens. Surprisingly splendid! And pleasing for pets! Other than a couple of miscue's in the past which were corrected, the Staff has been great for our stays in a span of almost 15 years of renting from Cascade. Very nice property, great amenities and Kitchen if you want to cook. Nice big TV in the Living Room comfortable furniture and bed. Not sure about the Mirror on the wall in the Dining Area, I could do with out it and the Parking is pretty scarce but otherwise very nice. We will be back again. The home was lovely! My only issue was the pillows on the bed were too fluffy for me -- but I'm an oddball about liking flat pillows. The condo was beautiful, the lake view was mesmerizing, the electric fireplace was easy to use and cozy, the whirlpool tub was a huge hit with my daughters... it was a wonderful stay. The overall home was great! I would however change the check in time to 2:00 or 3:00 and the check out time to 11:00 to 12:00 that time of year. Just a perfect spot! We were very pleasantly surprised at the quality of the home. Next time we will stay longer and also rent the upstairs to enjoy the bedroom views of the lake. I think this is right for any time of the year. A fantastic property at a fantastic location..! We had an amazing weekend. We stayed in a pet-friendly property, so we were able to take our dogs hiking with us in the state parks... really added to the enjoyment of our stay to have our "boys" with us. Location within BFB complex is terrific. We loved our stay, great location....close to the pool....very nice place....beautiful vacation.